There is always a country to regret and one to fight for. This is perhaps the only homeland. An inner place that does not need to be written in capital letters, and there is no flag that has the same power to shake the emotions. Summer 1943. In the aftermath of the fall of Mussolini, the anti-Fascists confined in the island of Ventotene claim and obtain liberation to join the resistance against the Nazi-Fascists. However, some of them are still considered to be enemies. The most of them are anarchists and foreigners. For them, the Badoglio's government orders the transfer to the concentration camp of Renicci d'Anghiari, not far from Arezzo. This is how begins the story of a journey that, between various attempts to escape and memories of struggle, will lead the group of anti-fascists «without homeland» to face the hardest trial: internment in a place where thousands of prisoners of war already suffered really hard conditions of life. The only hope: escape from the field. In the background, the forty-five days between the end of fascism and the armistice. A story that really happened, told through the lives of nine characters, formerly confined because of their rebellious past and with an uncertain future. Among them a futurist writer, Alberto Colini, a Catalan who escaped the Francoist repression, anarchists such as Alfonso Failla and Giovanni Domaschi, and a woman, Emilia Buonacosa, at length persecuted by the fascists. 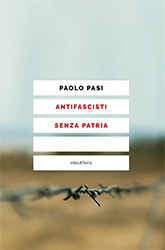 Paolo Pasi (Milano, 1963), is a journalist and a novelist. In 1995 he won the first edition of the Ilaria Alpi prize for investigative journalism. He has been working for the third channel the Italian national television (Rai 3) since 1996. Pasi is also a guitar player and a composer.